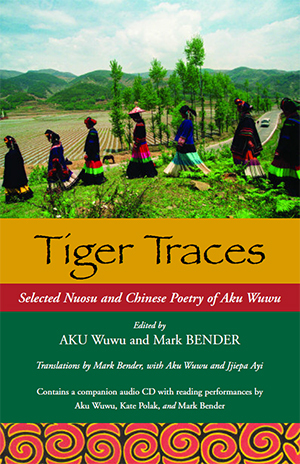 This book (with CD) introduce the poetic works of Aku Wuwu, a poet from an ethnic minority group in southwest China called Yi. Aku is a member of a subgroup of the Yi known as the Nuosu, who had an “independent kingdom” in the mountains of southern Sichuan province for hundreds of years. Although most contemporary Yi poets write in Chinese, Aku has taken the lead in composing poetry in the Nuosu dialect. Because of these efforts he has been called the “creator of modern poetry in Yi.” Aku is presently a professor of Yi Studies at Southwest Nationalities University, Chengdu, Sichuan province. The English versions of the Chinese language poems were made by Mark Bender (Professor of DEALL, OSU), while the versions of the Nuosu poems were made in a joint effort by Bender, Aku, and Jjiepa Ayi, a graduate of the Yi Studies Center at the Southwest Nationalities University. For the included recitation of the poems, Aku reads from both his Chinese language and Nuosu dialect poems, including his most famous work, “Calling Back the Soul of Zhyge Alu.” Kate Polak, a performance poet and graduate of the creative writing program at Ohio State University, joins Mark Bender in reading English versions of Aku’s poems. This is the first time Nuosu language poems have been released to a global audience. To purchase this book, please visit OSU Foreign Language Publications at https://flpubs.osu.edu.